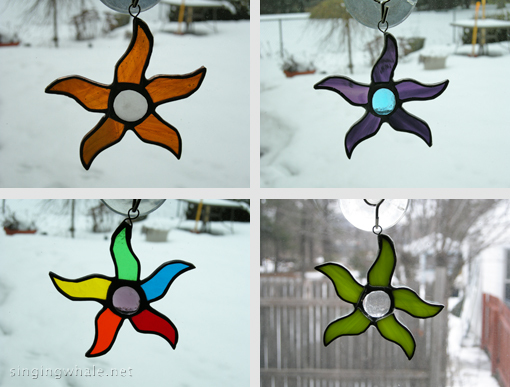 Who doesn’t enjoy colorful, joyful little suncatchers in their window? I save a lot of the scrap glass that is left over from most stained glass projects. Some pieces are much to small for any additional use and so are discarded (into recycling, not trash). But then there are the bigger bits… Those are ideal for making into these little dancing stars. I keep a small oaktag pattern piece at my cutting table so I can check right on the spot to see if a leftover bit of glass is big enough. And then those pieces of scrap are stashed to be reused for making these dancing stars. The finished suncatchers are about 2″ by 2″, and can be made with any glass, with any (complementary) color center. I’ll be making lots of red stars soon, from scrap leftover from making a big pile of cardinals last December. What other color combinations would you like to see? 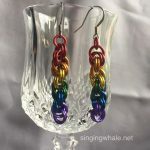 Most are all one color glass, but I also make rainbow versions. At $10 each, these are terrific gifts, lovely handmade Christmas tree ornaments (I can put ribbons on those for easy hanging), or just a little colorful suncatcher to hang in your window. I’ve got several small bins getting full with scrap glass so I think I will making a lot of these little dancing stars as I go. They are nice, quick little projects to do in between bigger ones. This entry was posted in misc and tagged ornaments, stars, suncatchers. Bookmark the permalink.